Here are the American remakes of Asian horror movies which I've bought so far. I'm not a big fan of Asian horror or remakes, but I got them cheap. One day, I might review some more of these, but, every time I look at the growing number of remakes on my list, I just can't find it within myself to actually bother. 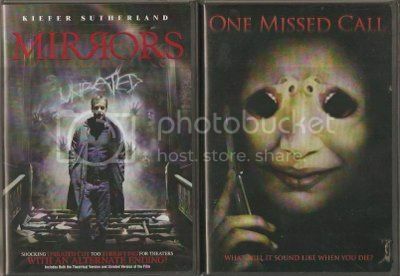 I've only reviewed "Shutter" and "The Uninvited" on this blog. Suffice it to say that I do like most of these films with the exceptions of "Dark Water", "The Ring Two", and "Mirrors". I think the remakes of "The Grudge" are just as good if not better than the originals and "The Uninvited" was simply a lot easier to understand than "A Tale of Two Sisters". Which do you prefer? The remakes or the originals?